Strike Vectors aerial combat is brilliant and beautiful, but it needs to be put into a package that does it justice. I spawn into every life of Strike Vector like a missile out of hell. Jets flaring, blurred periphery, hurtling toward a futuristic metal landscape. Other Vectors come for me, firing rockets and mini guns, dropping mines, zapping me from miles away with plasma snipers. I need to pull up, maybe slow down for a better shot and risk being an easy target. I need to figure it out quick or I'll crash into something and explode. I barely hang on for every second of every match, so surviving feels like a victory, and taking out another Vector, watching it spiral out of control and slam into a girder in a blinding explosion, feels like it deserves a medal from the Air Force. It reminds me of unforgiving arena shooters like Quake III and Unreal Tournament, but Strike Vector puts wings on the genre and creates something surprising in the process. 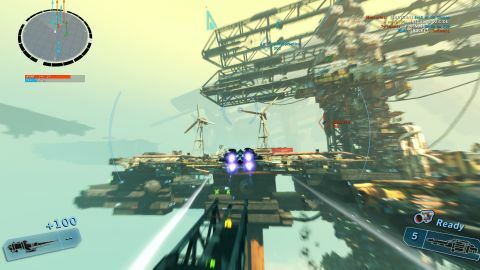 Reductively, it's very much “an aerial FPS,” as developer Ragequit describes it, but its freedom of movement creates an experience that totally sets it far apart from other shooters. Now all Ragequit has to do is build more of a game around it. Being able to weave in and out structures, narrowly slamming into cranes and pipes at breakneck speeds, uses my twitchy mouse hand in a completely new way. I'm able to fly with as much precision as a I have with a mouse cursor, so I can thread my ship through dozens of near misses in as many seconds, but one millimeter the wrong way ends in an embarrassing death. Combine that with the ability to stop almost instantaneously and have the kind of freeform movement we used to see in games like Descent, and your mobility is limited mostly by your imagination and skill. Unlike other shooters that have very clear paths and "hot spots," in Strike Vector there are infinite ways to get from point A to B, and being unpredictable gives you an edge. I'm not the best shot in the world, but I'm a pretty good pilot. Whenever I feel outgunned, I hit the boost and fly into the most claustrophobic part of the level. There, I can either lead my attacker into a tunnel where I've dropped mines, or turn a corner, quickly slide into a small nook, then hit him with two shotguns blasts when he pops up. It feels more exciting because Strike Vector looks freaking rad. Much like Hawken creators Adhesive Games, Ragequit knows that Unreal Engine 3 is great at rendering a dirty, bleak, war between machines, highlighted with a few neon lights and many explosions. The engine keeps up with the speed of gameplay without sacrificing little details you mostly just zoom by, creating a giddy feeling of overstimulation. Being an unusual multiplayer shooter is good, but it also means that Strike Vector comes with a steep learning curve. Your Call of Duty and Battlefield experience doesn't apply here, and the tutorial amounts to only nine slides of text and still images. There are eight weapons and a variety of upgrades, passive abilities, and perks. All of these are available to you from the beginning, but Strike Vector makes no effort to explain advantages and disadvantages, or how they might be useful in different situations. It was a couple of frustrating hours before I discovered a useful loadout, an unimaginative double dose of gatling guns. After I was killed by enough rockets, I learned how to use those as well, and think I've figured it out. The missile seems to explode if it gets close enough, so you don't have to be as accurate as you'd think, though its mechanics aren't transparent. Strike Vector does so little to explain itself, I still don't understand how the homing missile locks on, how swarm missiles work, or why I would ever use an LMG over a gattling gun. Maybe they need to be rebalanced or some of the weapons just aren't worth using, and were included for variety—in which case they aren't valuable. Half of the tools available are a mystery to me, and there's a design problem there. Say what you will about Call of Duty's weapon unlocking, at least it creates a logical progression, and, more importantly, gives me incentives to experiment. Strike Vector's greatest error isn't just that it assumes that I'll manage to figure it out—I can do that in time—but that it assumes I'll want to while better players swat me out of the air repeatedly. Because I have no way of knowing if it's my choice of weapons, my aiming, or my strategies that are failing me, I don't know how to improve other than by a frustrating process of elimination. In Counter-Strike: Global Offensive, for instance, every round teaches you something about your weapon choice or positioning—in Strike Vector, you can go 10 spawns with the gatling gun and get very little feedback about your failures. I play a lot of shooters, and most of them have left me kind of numb lately, so Strike Vector was worth my time for its novel concepts alone. It looks amazing, and while I lose far more than I win, those wins are satisfying enough to keep me coming back for more punishment. I hope Ragequit brings order to the disarray surrounding the combat, which deserves to be experienced.